Coco Martin and Dingdong Dantes are both into luxury motorcycles. For the boys, one of the hardest decisions they probably have to make is to choose between cars or motorbikes. With their fat paychecks, it's not surprising to know that they can have both. Some of local tinseltown's big boys have already amassed quite a collection of big bikes. Paulo Avelino is motivated by the former. However, many Filipinos are still afraid of the dangers of riding a motorbike. Jericho Rosales, who has been collecting and customizing big bikes for more than two years, is hopeful this stigma would soon be erased through responsible bikers. He told PEP.ph, "Gusto ko mawala sana yung stigma. "Hindi lahat ng motorcycle riders in Manila medyo sira-ulo. "Us, responsible bikers, are working hard in helping change that image of motorcycle riders by following rules, being more of a gentleman on the bike." Dingdong received a Ducati Diavel as a gift from wife Marian Rivera in 2011. This motorbike is also the one he drove to his wedding last December 2014. According to Top Gear Philippines, the base model was sold at PHP1.25 million in 2011. The top-of-the line carbon-fiber-clad Diavel Carbon had a price tag of PHP1.45 million. Paulo has always been fascinated with big bikes because of his dad. He owns a BMW R Nine T.
When dealer BMW Motorrad introduced the four new R nine T models in March 2017, the retail price was PHP1.19 million. 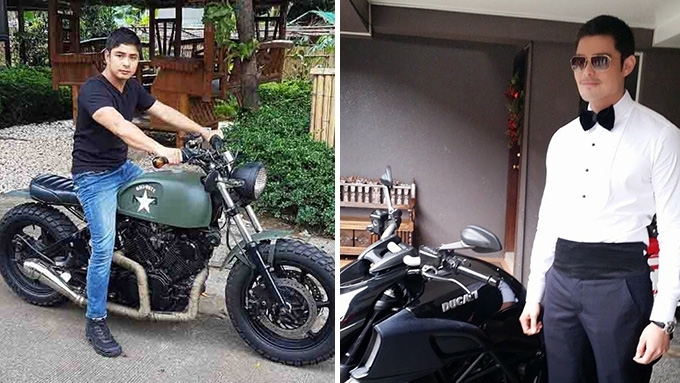 Aga recently got back into motorbike riding and explored the streets of Manila with his customized BMW R Nine T.
The Kapamilya actor uploaded some of his photos on his Instagram last Friday, February 2, and wrote, "Another great ride! "Thank you @sidmaderazo for accompanying me for my 1st ride in Manila after so many years. And always for the great photos. "Happy to be riding again! And of course to my ever beautiful and lovely wife @itsmecharleneg. thank you for allowing me to ride again! prayers answered! love you B!!! #ridesafe #titoagaridesagain #rninet"
Sid Maderazo is part of Brap Pack, which is the riding group of Jericho Rosales, Ryan Agoncillo, Drew Arellano, Paolo Abrera, among others. Coco owns a number of motorbikes, most of which are sprawled in the garage of his beautiful Quezon City mansion. One of the standouts in his collection is a BMW R Nine T Racer, which was launched to the Philippine market in 2017 with a base price of PHP1.09 million. Richard Gutierrez is one of the "three legit owners" of Ducati Paul Smart here in the Philippines. According to Ducati Philippines' dealer on Katipunan Avenue, the 2003 model had a price range of PHP900,000 to PHP1 million. Super dad Ian has been into thrill-inducing activities ever since. When he's not paragliding, you can find him cruising cross-country in his motorbike. He owns a BMW GS 1200—which was priced at PHP1.45 million, according to an article published by Top Gear Philippines. Jerico's collection of motorbikes includes a Vespa scooter, a dirt bike, and a Ducati Scrambler. Probably one of favorites is his Ural Solo ST Cruiser, which retails PHP655,000 on the website of motorcycle dealer Ropali. Ryan likes using his Ducati Hyperstrada 821, which is now known as Ducati Hypermotard. Ducati Katipunan offers it for a base price of PHP950,000. Romnick owns three big bikes: a Kawasaki W800, a Harley Davidson Sportster Forty-Eight, and his most recent purchase, the Harley Davidson Street 750. Based on the current price list of Harley Davidson of Manila, the latter has a retail price of PHP573,000 for the black units, and PHP608,000 for the two-tone units. The Harley Davidson Sportster Forty-Eight is priced at PHP1.03 million (black) and PHP1.08 million (hard candy), according to the price list released by the brand's authorized dealer in Manila. Meanwhile, the Kawasaki W800 has a PHP447,000 introductory price. Drew also goes on adventure trips with the Brap Pack with his BMW GS 1200. He received this Royal Enfield motorbike as an anniversary gift from his wife Gladys Reyes last year. Helping the couple acquire the Bullet Classic 500 motorcycle was their good friend Ryan Agoncillo. According to Royal Enfield Philippines' website, the base model costs PHP313,000.